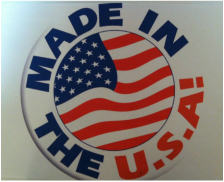 The Insta-Mold Process has been utilized by the hearing healthcare industry for almost 40 years. It is the only process written up in the Archives of Otolaryngology & Otology, and continues to be consistently recognized worldwide for its proven protection against extreme noise and water. 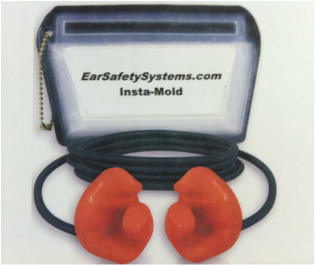 Insta-Mold earplugs are made "on-the-spot" and are customized to fit your ear with increased comfort, maximum attenu­ation value and greater convenience than most off-the-shelf ear protection products. When made correctly, they will provide a reliable "tissue-to-tissue" fit duplicating every crevice and contour of the ear. This allows the user to wear these earplugs for long periods of time without discomfort, irritation or constant removal from the ear for reinsertion. This "ultimate fit" will also achieve the best attainable NRR rating, and provides the maximum in hearing protection for the user. The noise attenuation chart below, from tests performed by one of the most reputable testing facilities in the world, displays the amount of protection you can receive from a properly fit set of Insta-Molds through the common frequency spectrum. Specialty and filtered hearing pro­tection and communication ear­pieces are designed to address specific requirements or applica­tions. These include racing, law enforcement radio communica­tions, musicians, stethoscopes, MP3 players, cell-phone usage, pilots and other needs. These heat-curable ear molds have similar characteristics to our "On-the-Spot" Insta-Mold silicones, but have better durability and flex. We can add acoustic filters to lower the overall NRR rating, while still reducing harmful sounds to permissible levels. We can even make them glow in the dark! Acoustic Filtered Plugs. These specialized patented filters are inserted into a custom mold to allow safe sounds - those below 80 dB like normal conversation - to pass virtually unattenuated. For sounds higher than 80 dB, these filters limit the sound attenuation to OSHA regulated require­ments. Best used in industrial noise and shotgun sports for those who want to hear conversation or auditory signals coming from machinery. Communication Earpieces. The Skeleton-style earpiece is used by operatives in undercover occupations such as FBI, SWAT, police and security teams, as well as broadcast professionals. Pilot's Earpiece. Pilots have several choices in headset communi­cations. Two of the more popular boom mic systems are the light­weight Telex 5x5 Pro III and the Plantronics MS-50-T30-2. Both can work with a customized ear mold, which features an adjustable boom for microphone positioning. Racing Monitors. In the amateur and professional racing circuit, communications is a must for pit crews and drivers. Relaying vital strate­gic plans, communicating current positions, and/or possible upcoming hazards on the track is an invaluable asset to a racing team's success. Ear Bud Bluetooth®/Headphones Ear Molds, available for music and cellular telephone headsets, increase the comfort of the generic unit and isolate the ear from harmful ambient noise. In effect, the user can decrease the volume of the audio source to reduce risk of hearing loss. For cell phone systems, "hands-free" operations provide safety while driving and are now required in several states. Water Sports Earplugs. Used by many who want to hear some of their surroundings but keep water and cold air from entering their ears. Great for active individuals who are trying to prevent surfer's ear and other complications from water activities like ear infections, etc.